Tip Top Herretøjsmagasin (Tip Top Men’s Clothing Shop), was my grandfather Carl Jensen’s business, located in Møllergade 6, Svendborg. Here, he sold men’s clothes from 1933 – 49. He died in 1949. My mother was 16 years old. Later she moved to Copenhagen and graduated as a tailor and designer. My mother Pia Franke Hedegaard passed away in 2006. In the aftermath of her death, I took a variety of materials from her workshop studio. This new artwork consists of two parts, which were installed in Svendborg: SAK- kunstbygning (SAK art building) and the Louis Nielsen boutique on Møllergade 6. 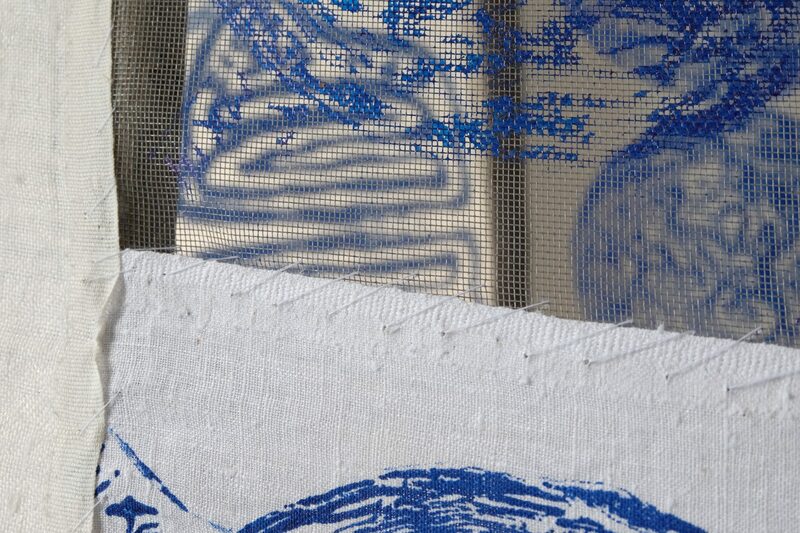 This part of the work consists of my mother’s curtains, with a print of my grandfather’s shop window Tip Top from Møllergade 6. The illustration above is from an ad in Svendborg’s local newspaper, circa 1943. The second part of the work is seen in the SAK Art Building, which here consists of the same image of my grandfather’s shop window, printed on Plexiglas. Behind the plexiglas lies on the floor textiles from my mother’s sister’s room. Out of fabrics I have drawn and sewn a new collection, to myself. Essentially, the work is about loss, sadness and transformation. It is about how I can better understand my mother’s grief when she lost her father or when I lost my mother. Care is a persistent feeling that creates great change when you are ready to seize it. Shown at Svendborg: SAK- kunstbygning (SAK art building) and Louis Nielsen boutique Mølergade 6, Svendborg. Materials: Plexiglas, textile, metal, and image-printed mirror. 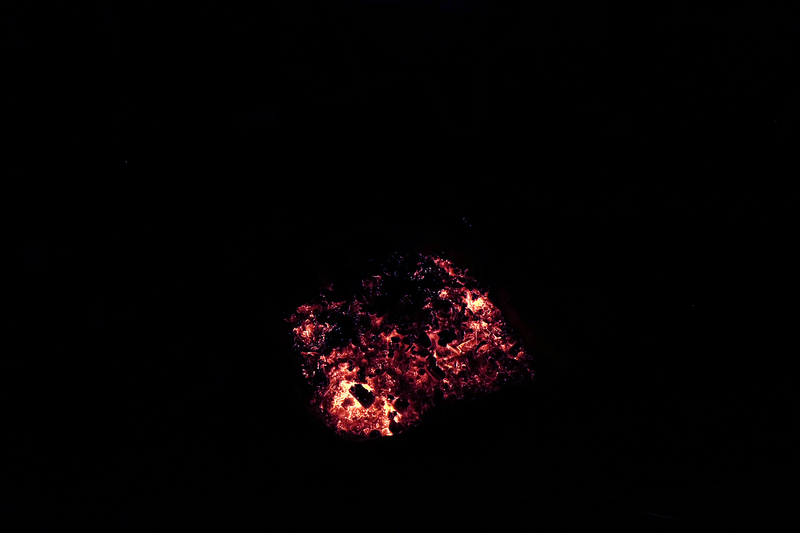 Investigating soil from the garden and burning clay from soil collected in the suburb of Herlev. Part of a collaboration between SixtyEight Art Institute and InstantHERLEV institute in preparation for the ‘SOIL’ exhibition by Anja Franke. 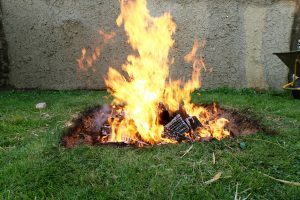 This dual-site exhibition starts as part of a investigations process event, open to the public as of the 22 of july, 2017 at InstantHERLEV institute and with an exhibition component, opening in Copenhagen, on 8. September, 2017 at SixtyEight Art Institute. The exhibition will be on view from 8. September — 30. September, 2017. Participate artist: Book&Hedén (N), Camilla Reyman (DK), Esben Klemann (DK), Anja Franke (DK). The image above is from the IHi frontgarden where we have dug soil, examined it and found clay. 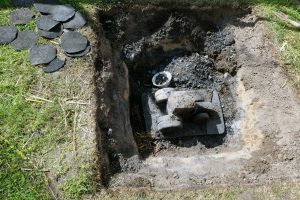 The hole for a outdoor fire or a ‘ready-made kiln’ to bake the various clay forms that come out of these soils. The SOIL exhibition is based on investigation soil collected as material for a series of sculptures, produced from these clays. In addition, through a materialistic ground study, five artists will present new artworks produced with other earthly materials and that in their own way investigate different states, agents, organisms and cultural constructions around soil. 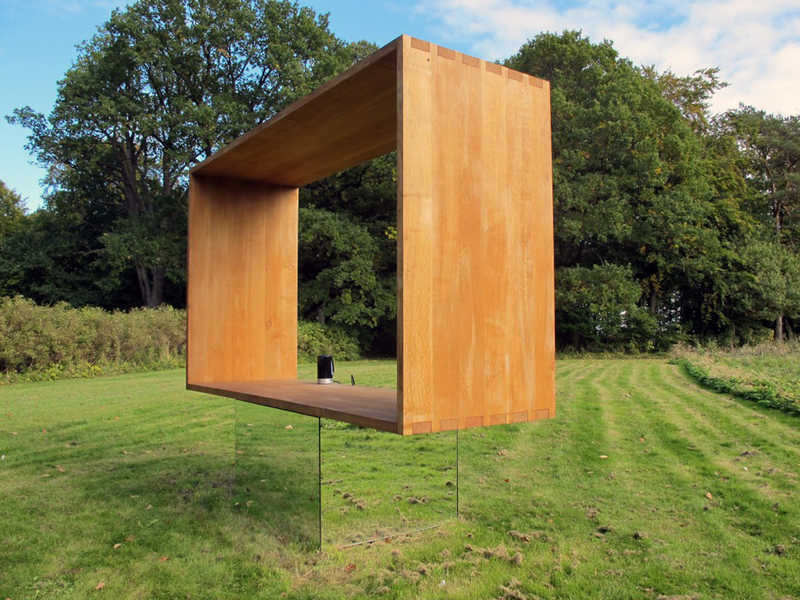 Fredensborg Municipality Art Foundation has acquired the work TEA WITH A VIEW II by Danish artist Anja Franke. The artwork is now set in the beautiful park at Nivaagaards Malerisamling. In this context Fredensborg Municipality inaugurated the work at Nivaagaard Picture Gallery on Wednesday 25 September 17.00 . TEA WITH A VIEW II had been exhibited earlier this year at Sculpture Festival Sculpture by the Sea in Aarhus, where it won the Sculpture by the Sea Award. Now the citizens of the municipality of Fredensborg and visitors to Nivaagaards Malerisamling can joy of the work. The sculpture consists of oak , solar cells, plate glass and a kettle that invite one to stay and wonder, but also as a sculpture for social interaction. The audience is invited to boil water in the boiler, pick fresh mint from a nearby herb garden and enjoy a cup of tea in the sculpture that is overlooking one of North Zealand’s most beautiful views. TEA WITH A VIEW II at Nivaagaard Malerisamling, www.nivaagaard.dk. Facebook.com/Malerisamling. Sponcor by PP Møbler, Allerød, Denmark. Dag og Nat (Day and Night) permanently installed in Skovlunde Bypark was created by the in 2015. Dag og Nat is the result of a collaboration between the Danish Arts Foundation and Ballerup Kommune (Municipality) about an artwork that looks to create a new meeting point and as well improve accessibility to this city park. This video was produced by Ballerup Kommune as an effort to introduce the artwork in general. By Invitation Only was an exhibition guest-curated by Lucía Sanromán at InstantHerlev Institute exploring the concept of hospitality through its negative modes of exclusion, control, discrimination and social stereotyping. Through this exploration, the exhibit correlated this Danish home with the nation. The exhibition looked at the concepts of radical hospitality as the underlying basis for challenging the philosophical ideas that conform foreign international relations — including asylum policies, national security, and humanitarian intervention. This video captures to some extent the environment established by the exhibition during the summer of 2014; as seen through the eyes of a local TV station in Herlev, Denmark. Danish, no English subtitles. 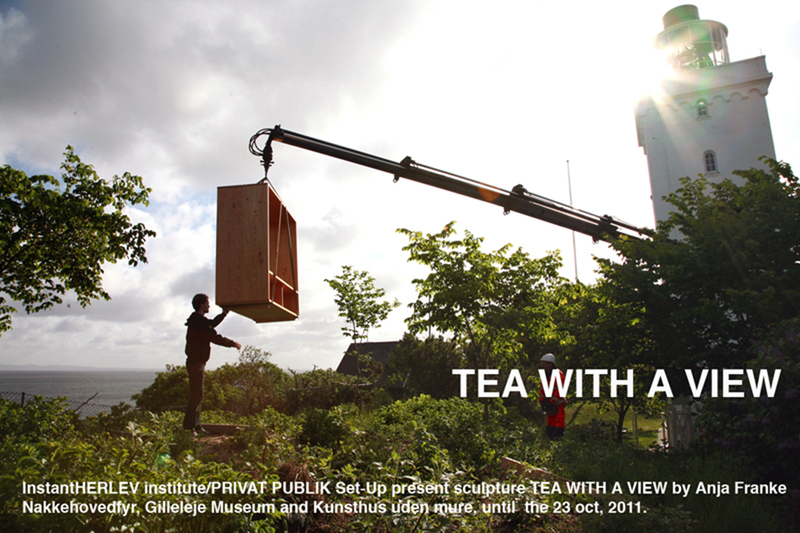 InstantHerlev institute/PRIVAT PUBLIK install the sculpture TEA WITH A VIEW by Anja Franke Nakkehovedfyr, Gilleleje Museum and Kunsthus uden mure, on view until 23 OCT 2011.